So tomorrow A Wizard’s Gambit comes out on Amazon and Smashwords! I’m pretty excited about that. The sales numbers don’t register until the books go out, I guess. I know of one pre-order for sure, and I’m wondering if anyone else will. Honestly, with all the copies I gave out to Indiegogo supporters, editors, and beta readers, there aren’t a whole lot of other people to pre-order! I know there are more people waiting for the paperback, too, so I’m hoping the author proof looks good and I can get that set up soon. With all that in mind, I’m going in with realistic, low expectations. A Noble’s Quest was not a runaway success, and this one won’t be either. I learned a long time ago that most authors don’t get famous overnight, and what helps is building up a collection. So now I have a collection of two novels, a collection of short stories, and a standalone short story in Theme-thology: New Myths. Not bad for just before my 36th birthday! It blows my mind that I’ll have an entire trilogy out well before I’m 40… maybe even the first book of my second series (we’ll see how things progress). And I’m working on my next novella, Demon Invasion. It’s almost done. I’ve just finished a final proof-read with the new knowledge I’ve gained through the course of editing A Wizard’s Gambit to make my aunt’s life a little easier. Pre-order A Wizard’s Gambit now! I’ve finished my final reading of A Wizard’s Gambit! +Harvey Bunda was under the weather last weekend, so he’ll be getting the paper back cover to me soon. I went through +Andy Goldman‘s notes and e-books are out to Indiegogo supporters. Thanks for your patience, especially to my Indiegogo supporters. I know I thought the book was going to be out in 2013/2014, but that was before I realized how much editing work was required. Now that I know the difference between developmental and line editing, I can better plan for future releases. With the book out, I’ll be re-reading my novella Demon Invasion and sending it out for line editing. Then it’s back to work on writing the final book in the Empire’s Foundation trilogy, A Hero’s Birth. This week I finished an in-depth outline for the book, so that should help speed up the writing process. At first I though I would follow the antagonist all the way through the book, but it’s going to bloat the story too much. I’ll follow him at key points, but I’m going to have another character describe interactions with the antagonist while the protagonists were busy elsewhere. In this way I can give the information, and let the reader wonder what he’s up to. While I’m writing A Hero’s Birth, I’ll also be starting up my final Indiegogo campaign, where I’ll be posting one ad per day over a 30 day time period. The idea is that they will be unique and interesting, so as not to irritate people. I hate annoying ads that say no more than “Buy my book!” So I want to keep it fresh, both for myself and for anyone who is (un)lucky enough to see every single ad. Pre-orders for my latest epic fantasy installment, A Wizard’s Gambit, are now available for only $5! That’s only $1 more than my first book, and almost twice the content! Its official release date is April 5th, although my Indiegogo supporters can find their copy in their e-mail inboxes now! Thomas, Sarentha, and Eliza will learn that peace never lasts. After fighting for their freedom, wicked forces beyond the Tamorran Empire’s borders rise against them. 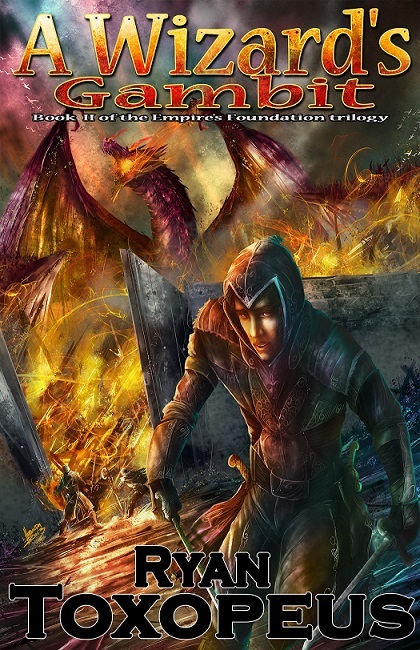 Tamor’s king falters when threats of genocide and an undead plague arise. The would-be heroes must fill new roles of responsibility and power to hold Tamor together. When more menaces emerge, each darker than the last, their adventure spans the entire continent. Thomas, Sarentha, and Eliza must make difficult choices and face their darkest fears to uncover their lost history by reviving long-dead wizards. Only by illuminating the past will they be able to step into the future. One misstep could lead to their undoing. Haven’t read the first book yet? A Noble’s Quest can be found on the same sites. If there’s one lesson I’ve learned over the course of bringing out two books, it’s that you shouldn’t rush. I learned that the hard way with A Noble’s Quest. I got it professionally edited, then published it. But back then I didn’t have all the writing contacts I do now, or the knowledge I’ve gained over time. I still don’t know everything (far from it! ), but going too fast because you’re eager to get a book out won’t help you. I hate lists that authors give with advice. Everyone has their own way of doing things, and different things work for different people. All that stuff is personal preference, not rules, even if the writer’s a jerk about it and tries to shove the belief down your throat. Sure, that’s what worked for them, but you are not them. There are probably as many different ways of writing as there are writers. 1) Put out the best work you can. That might sound silly. Of course we want to put our best foot forward, but it’s central to pretty much every point I’m going to make. 2) Don’t edit your own work. You know what you meant to write. When you’re reading your own writing, you will probably be blind to a lot of errors – my common problems are: repetitive wording, and using too many words when fewer are more effective. I miss that stuff every time. That’s why it’s vital to have an editor or two. I know some people with high levels of language education think they don’t need editors. They might be right. But for the rest of us, editors are your friends. I’ve read too many indie books that didn’t see an editor – actually, I haven’t read them. I start, then stop after a chapter or two. Do you really want your potential readers tossing your book and never looking at anything you write ever again? 3) Don’t send a line editor your first draft. Your first draft should be treated like garbage, not worth the pixels it was constructed with. I’m serious. Go through it at least three times yourself until you can’t find anything wrong with it. Then send it to beta readers to see if it makes sense. Sending a bad story with plot holes out to an editor for sentence structure and grammar checking isn’t going to make your story good. 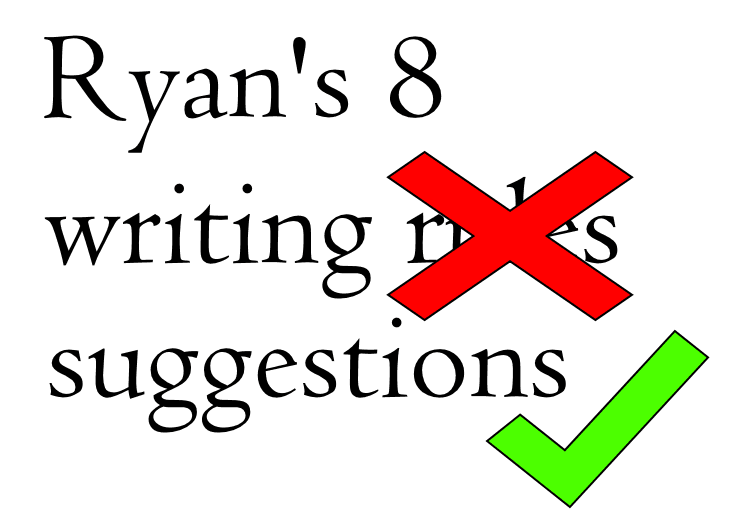 4) Don’t have “yes men” for beta readers. If you give it to your spouse, sibling, parent, aunt, etc with the hopes that they will tell you it’s a marvelous work with no errors whatsoever, just don’t. Find the most brutally honest people you know – maybe other writers – and get them to shred it. Now, if someone from that list doesn’t have a problem being honest with you and saying your writing needs work in various spots through the book, that’s fine. Personally, I send my book to my dad because he’s read so many fantasy/sci-fi books I can’t begin to count them, and he’s very honest in his feedback. But would I send my book to my mom for beta reading? Bless her, I love her to bits, but she doesn’t have a mean bone in her body and hearing the book is great on my first try isn’t going to help me put out my best work. She can enjoy the final product. 5) Don’t take it personally. Odds are, you haven’t created a masterpiece. Even after going through it yourself, and having beta readers critique it, it needs work. But at this point, you won’t be wasting your money going for editing… unless you go into it thinking you’re God’s gift to writing. Fighting with your editor is not going to make working with them easier. You may have creative differences, but that’s the point – you’re hiring the editor to tighten up your story. If you don’t want feedback, don’t write. Authors need to have a thick skin, because your writing won’t be for everyone, and you will get bad reviews/ratings. If you can’t even handle constructive criticism from someone who you’ve paid to give it to you, you’re in the wrong business. I’ve been told that I’m great to collaborate with from all three editors I’ve worked with. Why? Because I listen. I don’t have a big head about my writing, and I try to find ways to incorporate changes that make sense. I’m not saying be a door mat and let your editor walk all over your story. There will be certain things you want to keep, and that’s fine. But I’d say I keep about 90% of the changes my line editors make. Sometimes a word is suggested in place of 5 or 6 words, but that word is so archaic that I don’t want it because I’m hoping to get younger readers. In A Noble’s Quest, I used the word crepuscular because I loved it. But a beta reader came back to me and said, “WTF? This doesn’t fit with the feel of the rest of the book.” So I tossed it. It’s a beautiful word, but if readers don’t know it, it’s best not to use it. Now, if you’re writing highbrow pieces, you might want to challenge your readers and make them look up words. That’s not my aim, though. Developmental might be a bit lower… 70%? But even when we’re tossing ideas around and working out the kinks to make the flow better, I’m appreciative of all ideas put forward. Just some things don’t work with my vision. In the end, it’s your book, and your call, but at least be nice about it. 6) There are different kinds of editors. I was unaware of this until my second book. Developmental editors will look at the elements of your story: flow, progression, character growth, and red flags. By red flags, I mean something that you wrote that’s flat out wrong. They might offer suggestions for areas that need strengthening, or tell you that something you’ve done simply doesn’t work. Line editors are probably the sort of editor you first think about. They check your spelling, grammar, sentence structure, etc. I have never used a copy editor, but if you’re in journalism you probably use them to make sure you’re not going to wind up in court for what you’ve written. Not so relevant for fantasy writers. I can’t recommend developmental and line editors highly enough. Publishing a book is exciting. But don’t pull the trigger on publishing your book until you’ve double checked it, even after you think you’re done with it. Get someone else to proofread it, too! Granted, there’s only so much checking you can do, but by re-reading your book after editing, you might catch a few things you changed during edits that don’t read properly. Maybe you have a new double negative because you forgot to delete a word when you implemented the changes, and it would totally throw off the meaning you were going for. Maybe a word slipped past you, your beta readers, and your editors – we’re all human. You won’t come out with a perfect manuscript, but a thorough reading will help clean it up. All of these steps are important for building trust with your readers. If you can bring out a book with a solid story that reads well, people will come back to you. You’re not going to reach any level of fame overnight with one book, but you’re building your writing career one novel at a time. From what I’ve read, an author doesn’t gain a following until they have 4-6 books out. That’s right. That book you just slaved away on probably isn’t going to be a one-hit wonder that catapults you into the limelight. You probably won’t even make your money back on your investment if you stop there. It’s akin to a scam at the start, where you do all the work and get no reward and someone says, “But wait! Write another one, and things will get better!” You do that, see a minor uptick, still don’t break even, and that same person says, “Well, really, what did you expect with only two? Do it again!” And so if you’re really committed, you keep publishing until you’ve got enough books out there for people to take notice. Readers want to see what you’re made of, so trust is key to keep people coming back for more. Best of luck in your writing endeavours! And if you want to argue any of these points, please do so. I’m always up for a writing chat/debate. I’ve handed off my copy of A Wizard’s Gambit to +Andy Goldman for a final proof-read. I’m going to be spending time formatting, and re-reading the book. From the initial formatting I’ve done, it should be about 405 pages in paper back. I’ve tightened up the line spacing to condense it (fewer pages to print = lower cost for everyone). It’s tricky balancing “something for those who have already read the first book” and “don’t put in spoilers for new readers.” I’ll roll it around for a bit before sending it out to be put on the back cover of the paper back book. In the meantime, here’s some art created by the amazingly talented +Harvey Bunda. 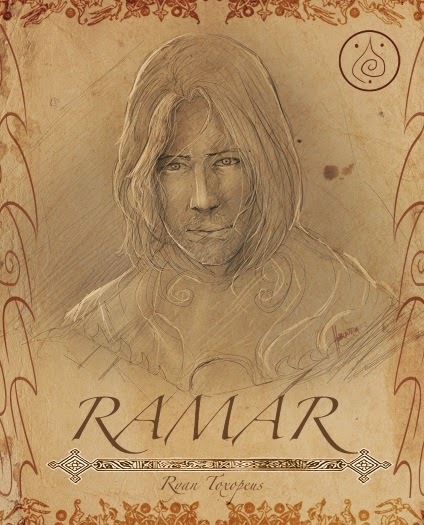 Ramar Wettias, top human wizard. When the Indiegogo campaign starts up, these are the sorts of character portrait cards that will be up for grabs if I make my goal and start getting into “stretch goal” territory. The pictures will be printed with the art on the front, a short write-up on the back, and shipped to anyone (including International backers) who requested a physical perk. I’d really like the full set. I’m counting on you guys! What is #PitMad? It’s this Twitter thing where upcoming authors try to snag an agent/publisher by posting a message about their book. #PitMad A Noble’s Quest is about 2 lumberjacks who kill a coworker and get swept into a nobleman’s plot to reveal a terrifying truth. I like being in charge. I write/edit at my own pace (which is insanely frantic right now, btw – editing of A Wizard’s Gambit is almost done). I have total control over what my covers look like. I can set my own strategies going forward. 85-90% of my sales don’t go to middle-men. So why take part in #PitMad? I heard some other authors saying it’s a great way to grow your follower numbers on Twitter (not that I use it much – I don’t think my life is interesting enough to tweet everything about it to entertain others). Also, I have a macabre hope that I’ll get a bite, and get to tell an agent I’m not interested in their work. +Shen Hart wanted to hear some Google+ authors’ responses to these 9 questions, so I put together this blog post to answer them. Enjoy! My wife is the only one I feel comfortable sharing my work with. Even so, she doesn’t get to read it until it’s ready for beta readers. But I’ve told her the entire timeline for all 10 books that I want to write. Whether or not it’s stuck is another thing! I do tend to ramble, and I wouldn’t fault her at all if most of the details got lost. It’s still nice that she listens. My family and friends have been very supportive. 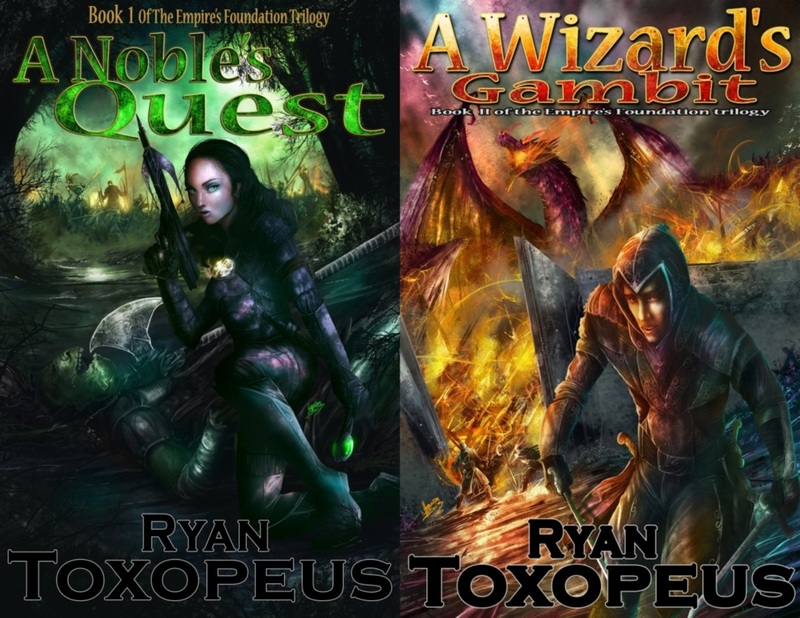 My mom was just telling me the other day she wants to re-read A Noble’s Quest before she starts with A Wizard’s Gambit when I release it in a few weeks. My Nan and Aunt were joking they needed to write down all the characters to try to keep track of everyone and their relations. My dad’s beta read everything I’ve written. I wouldn’t be writing at all if my friend Ian hadn’t encouraged me. And my family on my wife’s side has been wonderful, too! Aunt Mary offering to do the copy editing for my writing has been a tremendous help! And Uncle Rob was one of the first people to get a copy, and I’ve had good chats with him about writing. Trash. I’ve had a couple short stories I tried submitting that didn’t get accepted, so I forgot about them. I also tried to the traditional publishing route with my first “trunk” novel (it sits in darkness, never to see the light of day). I was young and foolish, didn’t follow any rules, and thought the book was brilliant – until all the rejections started coming in. That trunk novel might one day serve as the background for a future sci-fi novel, existing as a “the author only needs to know about all this, not the reader” sort of thing. I think I answered this in my last response. I just let it go. I read a lot of YA Fantasy when I was a teenager, and fell in love with R. A. Salvatore’s works. I haven’t kept up with Drizzt over the years, but one day I hope to get all the books I’ve missed. Daily life by a hair. Sometimes a conversation with someone will help me resolve an issue I have, but most of the ideas come from a mix of the old campaign around the gaming table, and my own imagination for how to revamp those sessions into a cohesive story. Pretty much all the indie books I’ve enjoyed. We indie authors suffer from under-appreciation all the time! It’s part of the package. +Andy Goldman‘s The Last City Left, +Lisa Cohen‘s Derelict, +Peter Smalley‘s Grimme, and +Matthew Graybosch‘s Without Bloodshed have all been great reads! Is it telling that I have no idea who those authors are? I have two books about writing. On Writing by Stephen King, and The Elements of F***ing Style by Chris Baker and Jacob Hanson. I have just started reading TEFS, and haven’t cracked OW yet. I tend to just write, and learn as I go. My editors have been very patient with me, showing me where I’ve screwed up and what the fixes are. But for reasons beyond my understanding, the Rules of English rarely stick in my head. Aunt Mary says there are signs that I’m learning from one book to the next, so that’s good, but I still tend to be too wordy. I published a terrible piece of poetry years ago. I was so proud of myself when I got published, but then I read that the group that was doing the publishing was scamming the authors. They would accept anything, knowing the authors would buy copies of the book (which I did). Last weekend I received the last round of editing from my Aunt Mary! A Wizard’s Gambit is coming along nicely. My wife has graciously accepted my need to get this book published, so she’s binge watching That 70’s Show on Netflix while I work to bring the book out (Oh, the sacrifices I make for writing… I love that show!). I imagine it’s lonely being a writer’s spouse. At least I’ve read it is. It’s not a spectator event, or something that a spouse can help with (except for maybe some beta reading, unless you’ve married an editor(although I hear you have to be careful with that sort of thing, so you don’t ruin your marriage over a book!)!). And sometimes we get a bit obsessed with what we’re working on, as shown in this installment of “Your Word’s Worth” by +Jefferson Smith. I’m fortunate my wife is so supportive. She’ll listen when I go on and on about these fictional characters in a world that exists in my head. She’s even grown to like them (I think). I’ll have to do something nice for her after I finish all this editing. Do you think she’d like a copy of A Wizard’s Gambit? One night of editing, two books updated! I have received the last round of editing back for my second book, A Wizard’s Gambit, and have gone through the prologue. Now that it’s finalized, I updated it in my published copies of A Noble’s Quest, where it appears at the end of the book as a teaser. 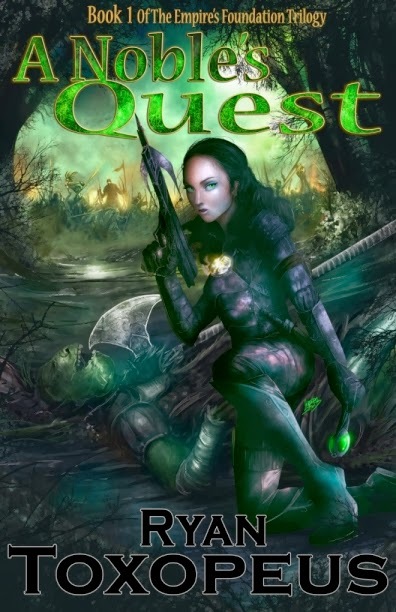 For those who have already purchased a paper back copy of A Noble’s Quest, this means you have a “First edition” print. I still have some more in a box for those who would like one. But any copies purchased through stores will be updated. The paper back will also be full justification now, instead of left, so it won’t have the ragged edges anymore. And I found a few instances where Thurzin was speaking and the apostrophe was turned the wrong way for words like ’em, ‘er, ‘is, etc. I saw an interesting headline the other day that people won’t judge books by their covers anymore because of e-books. I don’t know where they buy their e-books, but art couldn’t be more important. You’ve got people scrolling through books faster than ever online, and if a cover doesn’t grab their attention, your book is going to get missed. What I find unfortunate is that cover art has changed a lot to adapt to the new electronic market. I used to love the art on fantasy books, where you’d see the characters from a scene in the story. I’ve held true to that, but there are a lot of people going with obscure symbols or closeups on faces, because when your cover is a tiny thumbnail image, it’s hard to see a full scene. If someone was scrolling through a page, would they bother to click on my cover art to get a closer look? If they’re on a mobile device, the screen is so tiny they would never see it properly. But the paper backs look gorgeous. The posters are amazing. In this e-book focused culture, I think people sometimes forget about the larger picture. Yes, people are going to want e-books for a long time to come. They’re affordable (well, unless you’re buying traditionally published e-books), and you don’t need to clutter your living space with bookshelves (even though some of us like having bookshelves stacked to the brim with reading material). I’m thinking beyond the book. Maybe that’s dangerous when I’m just starting out, and haven’t proven myself yet. But I love the idea of creating beautiful artwork for fans who want more. It could be wishful thinking, but I look at the Empire’s Foundation trilogy as the foundation for creating a fan base and writing empire. I don’t think I could accomplish that without iconic scenes displayed for all to see. In other news, I crossed over 80,000 words in A Hero’s Birth this week, and it saw one of the protagonists do something pretty spectacular. I’m having a lot of fun with the story right now!